As soon as I saw that Melvita were launching a new moisturiser with smart technology that had enabled them to by pass added preservatives I was excited to try it. Let me start by saying that this didn’t disappoint one bit, in fact dare I say it definitely surpassed my expectations. The Apicosoma Soothing UHT cream (£30 for 40 ml) has been well loved by me since it arrived. A few weeks ago I had the most hideous cold, as someone with naturally dry and redness prone skin whenever I get ill my skin throws a proper tantrum. This time was no exception and by the end of the work day my skin wasn’t just dry but rather raw, red and feeling painful, I applied this after cleansing with a gentle balm cleanser fully expecting it to sting as most products do when skin is feeling this way, I was pleasantly surprised that not only did it not sting at all but that it brought immediate relief and a wonderful soothing sensation to the skin. Melvita for me are just doing everything right at the moment and this cream is something of a miracle worker, I would rate it as highly as my beloved Pai Skincare Chamomile and rosehip moisturiser and would recommend it for the most sensitive of skins thanks to the beautiful ingredients. The UHT technology is interesting as it is a new innovation from Melvita, there has been a big trend for raw formulations in the green beauty world to preserve the effectiveness of the ingredients, but what Melvita have done is develop a technology enabling them to flash sterilise and heat to a high temperature the ingredients whilst also preserving their properties, the key here is that it is done extremely rapidly (a couple of seconds) whereas in other formulas where heat is needed the ingredients are exposed for a lot longer. This means the cream has 0 added preservatives and relies on the UHT technology and packaging to keep the formula safe. It is worth noting the shelf life isn’t incredibly long, just three months, but personally I prefer to try and use up moisturisers within that time anyway. The cream comes in an airless pump which is great for preserving the formula, it is one of those products where as you don’t know when you are going to run out I am going to have to buy a backup as I don’t want to be without now. My only other small gripe with the airless pump is that you can’t seem to lock it shut and it could get knocked into the dispensing position if you are travelling with it, I am sure I will find a way around it as it’s a minor detail really. Aside from the locking issue, the pump itself is great because you never get the horrid hard lumps you can with some, as the product get’s stuck in the lid, this dispenses fresh product every use and closes up sealing the product back in. The scent is quite sweet, vanilla, caramel and honey are all present so that would make sense, it fades quickly after application. With continued use I have found that using this my skin feels protected all day and hydrated, I use one to two pumps daily after oil and serum and three pumps at night. If I need a more intensive treatment like I did when I had my cold I will use around four pumps and really lock in moisture. I also used this on a small burn on my hand which was very sore and it brought immediate relief and helped the burn not to scar, this is really good stuff to have around. The 3 Honeys balm (£10 for 8 grams) is just as lovely and extremely effective, anyone who reads this blog will know I love a good balm with honey in it and this one from Melvita is by far one of the best as it’s smooth texture and effective ingredients make it an absolute pleasure to use. A true multi-tasker, use this anywhere you have dry patches, I found it especially good and fast acting on sore skin and it healed the skin on my nose after just a couple of applications when I had my cold. You can’t fault the ingredients either, Shea butter, coconut oil, olive fruit oil, Buriti fruit oil and arnica make this balm wonderfully nurturing, healing and all round delicious. 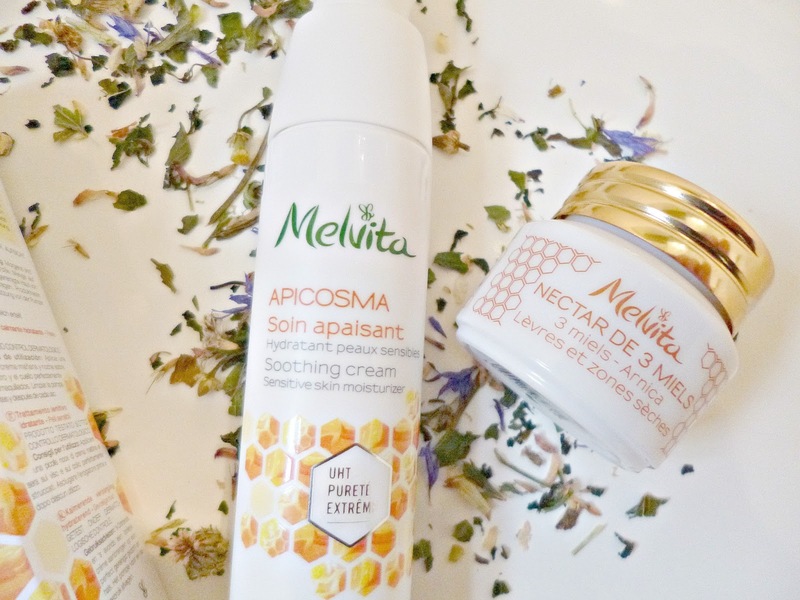 Both products have Melvita’s Patented three honey complex, which is mix of organic Acacia, orange blossom and Thyme, designed to soothe the skin. 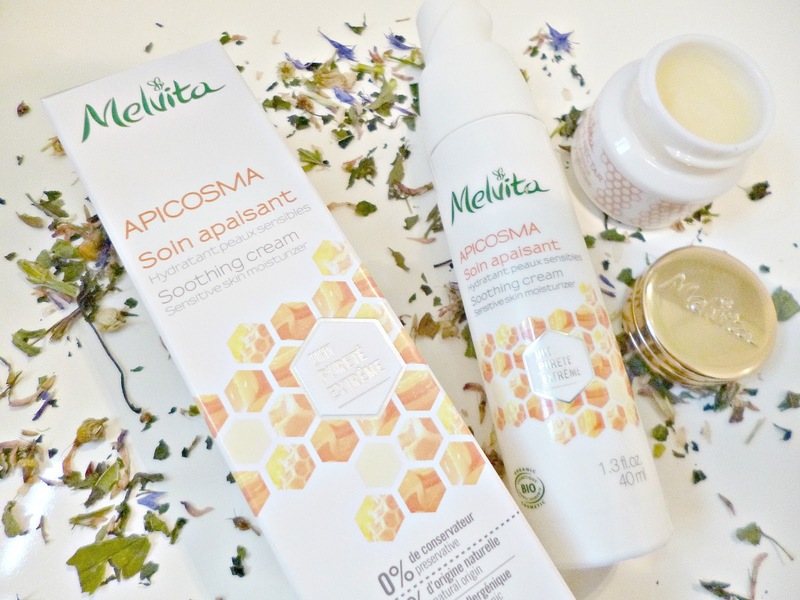 I am a big fan of honey in skincare and it is one of the reasons why I am loving Melvita’s new releases so much. Both of these are beautiful and perfect for sensitive and dry skins although I think everyone can have sensitised skin at some point and these are the perfect fix.